1.) Distribute a newsletter with fitness and healthy living information to educate your employees. 2.) Have those employees who are enthusiastic about the wellness initiative encourage coworkers to join in. 3.) Reimburse or subsidize employees gym memberships, group fitness registrations, etc. 4.) 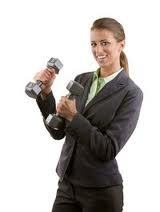 Offer employees flex time options to encourage participation in fitness activities. 5.) Be the leader! Top management set the tone for the company culture regarding fitness & wellness initiatives!